Beth Kenkel is currently a research scientist in the Department of Laboratory Medicine at the University of Washington. She is particularly interested in science communication and in vitro diagnostics. Follow Beth on twitter @ElizabethKenkel. The vast majority of bacteria are undomesticated which limits the tools scientists can use to study them. For example, gene knockdown with CRISPR interference (CRISPRi) has been limited to lab-adapted bacteria because it has been challenging to introduce CRISPRi machinery into diverse bacteria species. Existing protocols can transfer CRISPRi into a single bacterial strain, such as a B. subtilis, or a narrow range of bacterial species, such as the human gut bacteria B. thetaiotaomicron, Mycobacterium, Pseudomonas, and E. coli. However, many non-model bacterial species lack genetic tools. Mutagenesis is a tool that both evolution and molecular biologists use to tinker with DNA. Making changes to a DNA sequence can help scientists identify and/or facilitate the evolution of new phenotypes, and forward genetics harnesses this at a large scale by screening diverse libraries of genetic variants. Several methods for generating mutant libraries exist, but none provide a means to continuously diversify all nucleotides within a user-defined genomic region. EvolvR, a CRISPR-Cas9 based targeted mutagenesis method developed by the Dueber Lab at Berkeley, provides a new approach for generating novel genetic variants in bacteria. Read on to learn about the key components of EvolvR and its potential applications. Autophagy (Greek for “self-eating”) is a process by which cytoplasmic material, including organelles, are targeted to lysosomes for degradation. Autophagy is a dynamic process which involves autophagosome synthesis, delivery of materials to be degraded to the lysosome, and degradation of autophagic substrates inside the lysosome. Historically, methods for studying autophagy focused on counting the number of autophagosomes. This approach, however, has inherent limitations because it turns a dynamic process into a static measurement and it provides limited information about what materials or organelles are being targeted for autophagy. The development of several fluorescent autophagy reporters now allows for the measurement of autophagic flux, or the changes in autophagic activity, and are a more reliable indicator of autophagic activity. The aim of this post is to provide an overview of four autophagy biosensors currently available from Addgene. 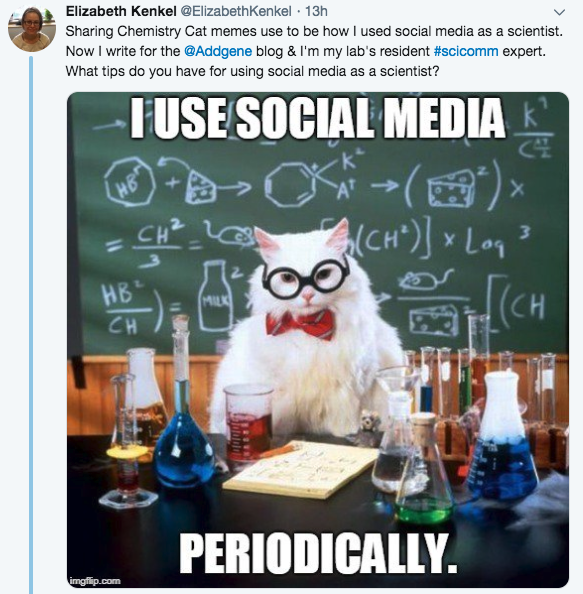 Before I started writing for the Addgene blog, sharing Chemistry Cat memes was how I used social media as a scientist. I mean, I had a LinkedIn page and a Twitter handle, but I wasn’t using them to my professional advantage. It wasn’t until I wrote a blog post about a research paper that explored how scientists connect on Twitter that I realized 1) a lot of scientists are using social media professionally, and 2) I needed to start using Twitter. My lab's vector of choice is AAV, with nearly every experiment requiring AAV. Before joining my lab, I had never worked with AAV, so naturally I had to package some virus for my first experiment. It was a bit intimidating, but I had my lab’s protocols and some great co-workers to help me out. Even with these tools, I found myself writing AAV production tricks into the margins of my protocol. While these tips weren’t critical to the experiment, they definitely made my life easier! 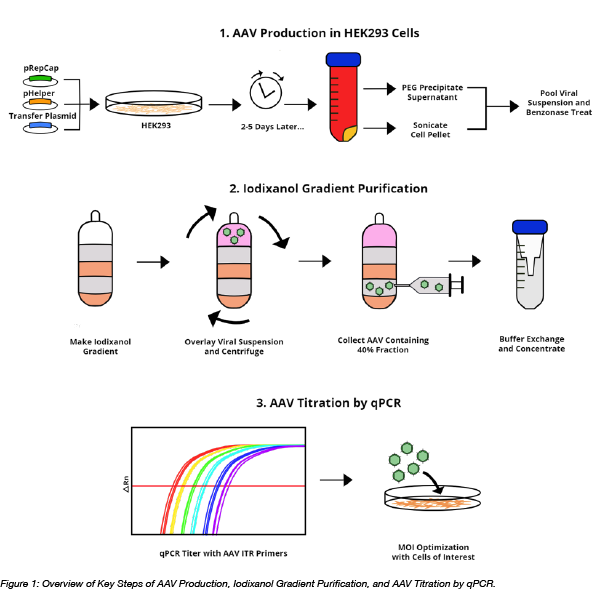 In this post, I’ll share some AAV production, purification, and titration tips, while also summarizing the basic steps and analyses needed for packaging AAV.